One of the goals of education is to shape and produce globally competitive and morally upright individuals who will dole as foundation of a nation’s great success. All this will be evident if the institution, which is the center of the individual’s transformation, realizes its contribution and effort for this enormous endeavor. To cater such venture, in school year 1996 – 1997, upon the direction of the Honorable Jose Emmanuel Carlos, Municipal Mayor, a Science Oriented Experimental Class (SOEC) was organized and housed at Valenzuela National High School (VNHS) Compound, Marulas, Valenzuela City, with forty (40) academically outstanding students. The wait came finally over on May 14, 2003, after seven (7) years of SOEC’s existence, an ordinance establishing the Valenzuela City Science High School (VCSHS) to be funded by the Local School Board of Valenzuela was approved, with Honorable Jose Emmanuel L. Carlos, former City Mayor of Valenzuela, leading the establishment together with the help of the City Council of Valenzuela and Dr. Aquilina S. Rivas, Schools Division Superintendent, VCSHS finally started to fulfill every great man’s dream in becoming a utilitarian citizen of Valenzuela on June 16, 2003. And the entire attempts of the persons behind this massive endeavor at last paid out. Having been optimistically engaging to prior actions such as, on February 08, 2003, a memorandum was sent to all principals of public and private elementary schools requesting them to inform the graduating students of their school to apply for the qualifying examination in preparation for the upcoming admission of first year students in VCSHS. Pushing through, on March 15, 2003, an Intelligent Quotient (IQ) Test was administered to 200 applicants. On March 22, 2003, passers of the IQ test took the second step of qualifying examination, the Proficiency Test. And on April 14 and 15, 2003, the passers of the Proficiency Test proceed in the Division Office of Valenzuela City to have their interview with the Division Supervisors. The successful applicants who passed the interview were requested to undergo medical examination as part of the screening processes. And at the end of it, a total of one hundred eight (108) students enrolled at VCSHS with Dr. Brian E. Ilan as their first Principal. Entwined with this on June 9, 2003, the first VCSHS Parents, Teachers, and Community Association (PTCA) came into being. A year of blessings, achievements, and struggles passed, from the original six (6) keen and sharp teachers the institution had an additional eight (8) teachers to the family. Not to mention, the additional flock of students making the VCSHS community bigger and bigger as the years passed. Vast triumphs also laid on the hands of VCSHS, as the students and teachers brought medals, trophies, and plaques of awards both in the division, regional, and national competitions. 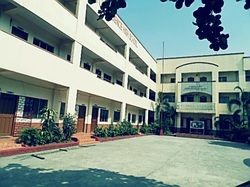 At the beginning of school year 2005-2006, VCSHS transferred in its newly constructed building at A. Marcelo St., Dalandanan, Valenzuela City. Honorable City Mayor Sherwin T. Gatchalian inaugurated the new house of VCSHS, ensuring a more opportune and viable educational system for its students. Together with this, an adopted fourth (4th) year students entered VCSHS, this SOEC group was composed of 4th year students from various schools who took and passed the qualifying examination prepared by the school. The culture of equaled intellectual strength has been established in VCSHS, having this new name more popular than VCSHS. In the midst of the school year, a new principal replaced Dr. Brain E. Ilan who had been promoted as Division Supervisor, Mrs. Lagrimas B. Bayle. Who in the same level achieve success for VCSHS vis-à-vis to former years. Through her time, a recorded shortest graduation happened for the fifteen (15) students of SOEC passing the 4th year curriculum of VCSHS. By the school year 2006-2007, another change on the principal seat happened, when Dr. Genindina M. Sumbillo entered Valsci from VNHS – Mapulang Lupa Annex in vice versa with Mrs. Lagrimas B. Bayle. The motherly leadership style of Dr. Genindina M. Sumbillo gave confidence to the Valsci community in achieving more and excelling than ever. With her management, the first graduates of VCSHS surpassed their four (4) years of stay in the institution. To mention, these graduates are now excelling in their collegiate life. Another year passed, and so another principal came. Before the end of school year 2007-2008, Mr. Arneil D. Aro replaced Dr. Genindina M. Sumbillo who had been promoted as principal of Caruhatan National High School. Vibrant and enthusiastic, the young principal of Valsci Mr. Arneil D. Aro, offered a new style of leadership to the community. With an aim of greater achievements and transparency to work, Mr. Arneil D. Aro is upbeat for VCSHS. In 2011 Mrs. Edelina I. Golloso, shortly managed the school as its Principal, upon the promotion and transfer of Mr. Aro to another school. Before the year 2011 ended, Dr. Brian E. Ilan, returned to Valsci as its Principal.